Becoming a CPA in Rhode Island is similar to entering the profession in many other states. 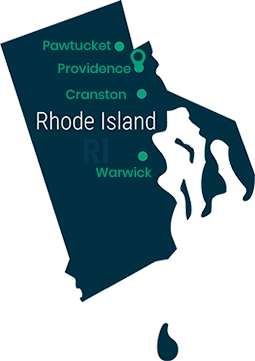 Rhode Island differs from many states in that license renewal and continuing education reporting requirements are done every three years. The Uniform CPA Examination consists of four sections: Auditing and Attestation, Regulation, Financial Accounting and Reporting and Business Environment and Concepts. You have four hours to complete each section of the exam, for a total of 16 hours. While you can take each section of the exam on a different date, you must complete the entire exam within 18 months of completing the initial section. You must pass each section with a score of at least 75. To take the CPA exam in Rhode Island, you must hold state residency or have a place of business or steady employment in the state. You will receive your Notification to Schedule (NTS) from the National Association of State Boards of Accountancy (NASBA) by either email, fax or regular mail, depending on your selection in your application. Testing centers for the Uniform CPA Examination in Rhode Island are in Warwick and Cumberland. Prometric handles exam scheduling for Rhode Island, so schedule your exam via their website. Arrive at the testing site at least half an hour before the test is scheduled to start. You will receive your exam scores in the mail. Using independent judgment and thought on non-routing accounting matters. Auditor or accountant for other governmental agencies. Applying the proper technical and behavioral standards to the work. Appraising the employer’s internal controls competency. Understanding the Rhode Island Board of Accountancy’s Code of Professional Conduct. Before you can begin your practical work experience, you must pass the home study “Professional Ethics: The AICPA’s Comprehensive Course.” You must receive a score of at least 90 percent on this ethics test to start your professional experience. When you apply for your license, you must attach a copy of the completion certificate to the application. If you are already licensed as a CPA in another state, you may be able to practice in Rhode Island as long as your license comes from a “substantially equivalent” state, which currently includes all U.S. states and territories with the exception of the U.S. Virgin Islands. If you are a solo practitioner, you must receive a Rhode Island license. However, if your work for a practice organized as a business entity, only one member of the practice requires individual Rhode Island licensure if the other members all hold substantially equivalent licenses from other states. Keep in mind that Rhode Island firms may require state licensing by their employees. You can apply for a reciprocal CPA certificate, which includes providing many of the requirements for standard Rhode Island licensing along with having the State Board in the state in which you are licensed send verification to the Rhode Island Board of Accountancy. Rhode Island CPAs must complete 120 semester hours of Continuing Professional Education (CPE) every three years. That is the equivalent of 15 days of formal instruction over the time period, or five days annually. Personal development and marketing courses may make up only 24 out of the total 120 semester hours during this three-year period. Self-study courses may not make up more than 80 out of the 120 CPE semester hours, while book or article publishing cannot exceed 60 out of the 120 CPE semester hours. Moderating or lecturing counts toward CPE credit, but not for more than 60 out of the 120 CPE hours. Such lecturing or moderating grants you two CPE hours per each hour of instruction.